A delicious buttery, cookie loaded with white chocolate chips, this White Chocolate Skillet Cookie is made for sharing. Oh that Martha Stewart is so crafty! I probably utter there words at least once a week if not more. I love Martha, she is a genius! How can anyone that has so many amazingly talented people working with/for her not considered so? With that said, Wednesday was the hubs and my third anniversary and so of course I had to bake him something. I was planning on cookies, but then he brought home a tray of them from the grocery store. I was like hey, I was gonna bake for you! He assured me that I did indeed need to, because the bakery cookies weren’t so good. Well I have been dying to use the vintage cast iron skillet my dad bought for me last year, so I decided a skillet cookie was in order. This cookie is buttery, delicious and definitely big enough to share, but you sure don’t have to – enjoy and happy baking! Preheat your oven to 350º and butter a 10" skillet. In the bowl of an electric mixer cream the butter and sugars until fluffy, add the vanilla and egg and beat until smooth. In a separate bowl whisk together the flour, baking soda and salt, add to the wet ingredients and beat until just combined. Stir in the chocolate chips and spread the dough into your skillet. Bake for 35-40 minutes until golden and the edges start to crisp. Remove from the oven and cool, slice and serve. I should try making a skillet cookie, they look so great! Love the flavors. Happy Anniversary! You should, it was the easiest cookie I’ve ever made! Your pictures are looking fantastic. Have you ever made this in a pie plate or other pan before? I don’t have a cast iron skillet but this sounds delicious! I haven’t but I bet it would work the same, it might just be a little thicker depending on the size of your pan, so you may need to tweak the baking time, good luck! I’d love to hear how it turns out if you try it. This looks delicious! Found you through Strut Your Stuff. Would love for you to share at the Creative Corner Hop. This looks just fantastic. Great picture. I cannot wait to try your recipe. Come over and visit us. We would love to have you. My son loves white chocolate. I’ll have to make this for him as a special treat! I hope you will, thanks for stopping by! 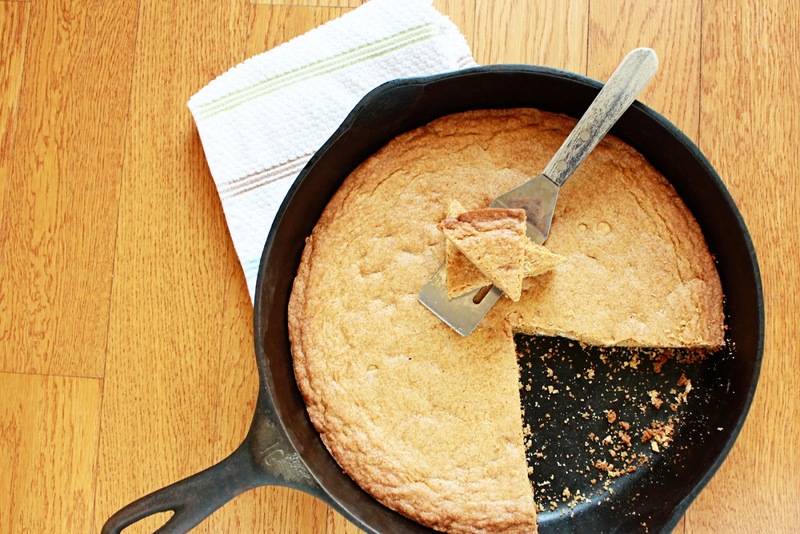 I really do need to pull my skillet out for a big gigantic cookie!!! Yours looks amazing!!! Thanks, it was a big hit!